Another Man Jumps White House Fence, But Is Stopped On The Lawn : The Two-Way A month after a man armed with a knife leapt the White House fence and got deep into the first floor of the building, another man made a run across the North Lawn Wednesday night. 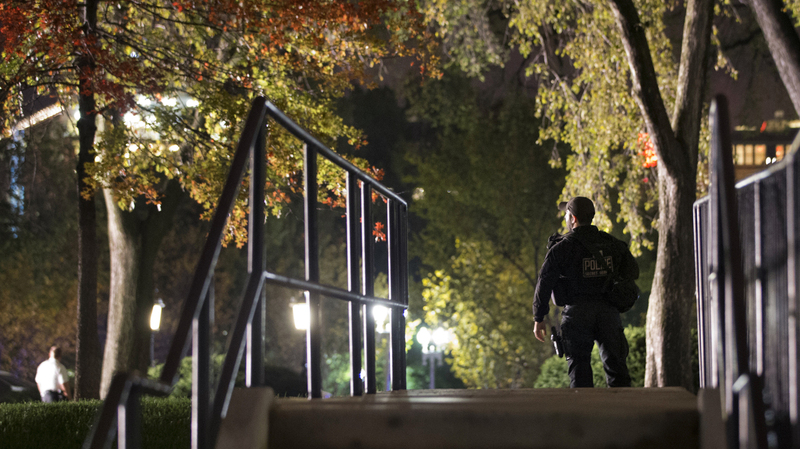 Secret Service respond on the North Lawn of the White House after a man jumped the White House fence Wednesday night. This latest incident comes about a month after a previous fence-jumper sprinted across the lawn, past armed uniformed agents, and entered the Executive Mansion. A month after a man armed with a knife leapt the White House fence and got deep into the first floor of the building, another man made a run across the North Lawn Wednesday night. His unannounced visit ended much sooner. NPR's Tamara Keith reports via Secret Service spokesman Ed Donovan that security dogs — which weren't deployed Sept. 19 when Omar Gonzalez trespassed — brought him down while he was still on the lawn. The apprehended man is being transported to a hospital for evaluation, Donovan said in a release. How Can The Secret Service Recover Its Reputation? The earlier intrusion resulted in the Oct. 1 resignation of Secret Service Director Julia Pierson, who herself had only been on the job since 2013, when she replaced the retiring director following a scandal involving agents and prostitutes in Colombia. Update at 10:10 p.m. ET: In an updated release, Donovan identified the arrested man as Dominic Adesanya, a 23-year-old from Bel Air, Md., northeast of Baltimore. The Secret Service spokesman also said two of the agency's dogs were taken to a veterinarian "for injuries sustained during the incident."